Barclaycard has unveiled Loop, the fourth product in its bPay contactless payment device range, which comes in the form of a contactless chip and lets consumers add NFC payment capability to the wearable devices they already own. The company has also teamed up with Swiss watch manufacturer Mondaine and wearable fitness device manufacturer Garmin to offer Loop to customers purchasing selected items from both brands from this month. “Made from a durable, textured silicon, Loop slides onto the strap of any existing watch or fitness band with an open buckle to create a new way to pay,” the company says. “As with the other bPay devices, it is available to anyone with a UK-registered Visa or MasterCard debit or credit card, not just Barclaycard or Barclays customers. “Loop comes in response to customer demand for a way to add payment functionality to wearables they already own — in particular, watches and fitness bands,” Barclaycard adds. “It becomes the first product widely available in the UK to offer consumers the opportunity to add payment capability to their existing devices. Loop measures 22mm wide and under and will retail at £19.99 (US$25.80). The device will go on sale later this week. The bPay Band was launched in June 2014 at the Pride in London and British Summer Time events in Hyde Park before being discontinued in March 2015. The company launched its second generation bPay devices in June of the same year. More than 100,000 bPay products have been sold and used to make a million transactions totalling more than £5m (US$6.45m), according to Barclaycard. 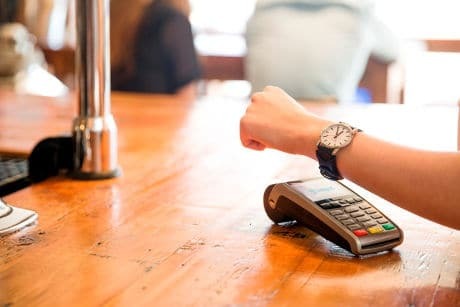 UK fashion retailer Topshop also launched the second collection of Topshop x bPay, a range of accessories that incorporate Barclaycard’s bPay contactless payment technology and enable shoppers to make tap and go payments at contactless terminals, last month. Topshop launched its first range of Topshop x bPay accessories in November 2015.